Sure, Dead Space 3 came out and all, but does Dead Space have a button you can press to dance? Until then, I don’t see it winning Game of the Week. No Time to Explain, as the title suggests, is a game best played and not described. I’ll try to keep this uncharacteristically short. No Time to Explain is akin to playing a Monty Python skit. 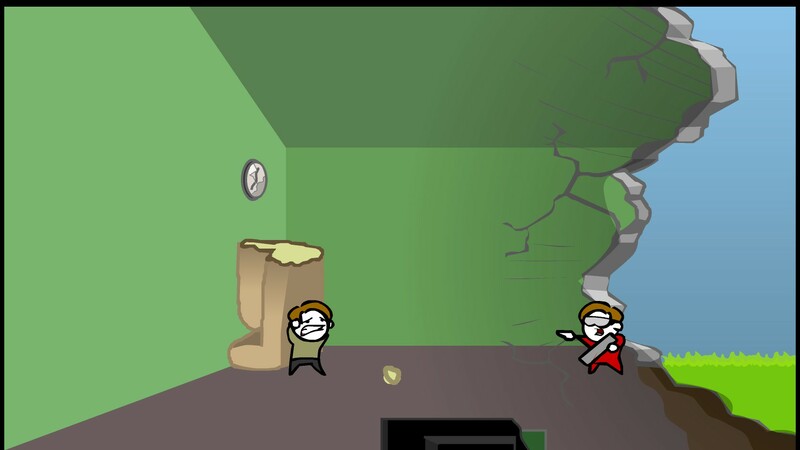 The game opens with you dancing in your house when the wall explodes. A future you announces “There’s no time to explain!” And is immediately grabbed by a horrible space crab creature. As he bleeds ludicrous amounts of blood (a fact he announces loudly and often while being mauled), you scoop up his laser blaster and run to the rescue. I don’t want to spoil too much, but just know; the version of you being grabbed and the creature that does the grabbing is subject to change as the game goes on. Before this moment I was dancing. By myself. Good times were had. The laser blaster becomes your key item for everything. It’ll get its primary function as a weapon against a variety of boss fights, but it has a much more important use. Sure, you have a jump button, but it won’t get you very far. The real trick to covering ground in No Time To Explain is using your blaster for momentum by firing into the ground. 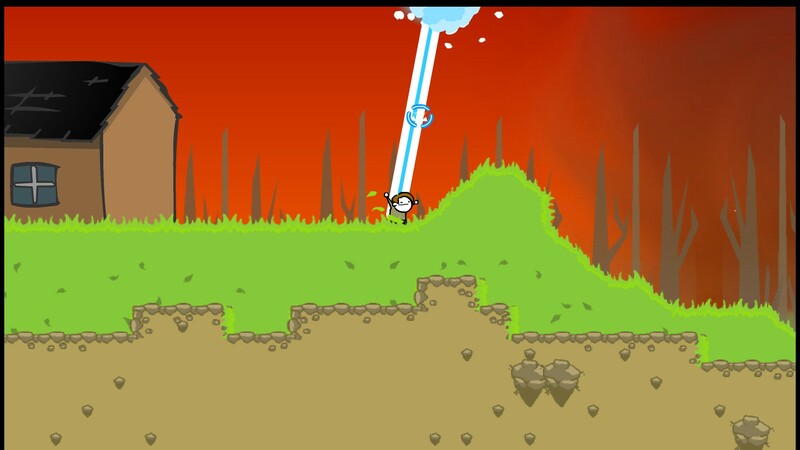 The first few seconds of a sustained blast launch you higher, but the longer the laser is sustained, the less powerful it becomes. 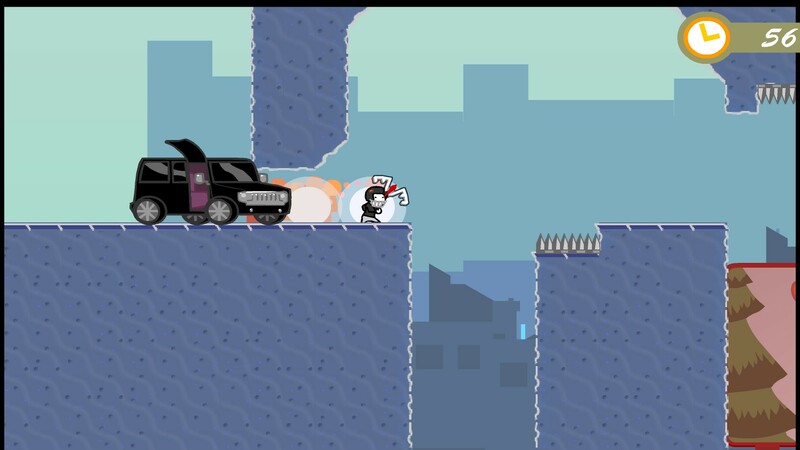 You’ll need its momentum to save you from a variety of death traps that impede your progress. Up, down, sideways- pretty much whatever direction spikes and fire aren’t. Did I mention that spacebar makes you dance? Did I also mention that you can fire your laser... while dancing? WOOO! I’m having an unreal amount of fun in this picture! There’s also a section early on that involve the main character being replaced by someone I’ll refer to as “Football Guy.” Instead of sustained bursts, he launches himself with one shot, like kicker becoming the ball. Its a very simple modification to the already existing formula, but somehow it makes the game feel entirely different. Instead of being able to make alterations mid-flight, you’ve really only got the one shot to line up. Also there’s something endearing about Football Guy. Especially the way he says “Doin’ it!” as he launches himself across the sky. I’d like to avoid getting into spoiler territory, because the absurdity of No Time To Explain really ought to be experienced on its own. Let it be known though, Football Guy is not the only time your controls will be altered. Whenever Football Guy shows up, he’s surrounded by adoring fans. There is one small caveat that ought to be mentioned. There’s currently a bug in the game that causes a nasty frame rate drop while moving your mouse, most commonly experienced by Windows 8 users. In a game like this where you’ll be doing that every second, it can create some problems, but there is a workaround while the devs (or dev, as the case may be) iron it out. Playing the game in windowed mode seems to do the trick, as does lowering your monitor's resolution. There’s been a few complaints floating around about the 10$ price point, mostly in regard to its short length, but I can’t say I agree. There seems to be a girth of unlockables available (mostly hats, of course), and the game provides a good mix of silliness and challenge. Its a game worthy of its Steam Greenlight status, and made a much bigger impression on me this week then anything else. Enough of an impression that I seriously considered writing “There’s No Time To Explain” and leaving at that, so I’d have more time to play.